LILY DALE, N.Y. — I like a good ghost story as much as the next gal, especially this time of year, when even the staunchest disbelievers hope to hear something go bump in the night. But communicating with the dead through a medium? Now there’s a scary thought. Still, here I am in this tiny speck of a village on the eastern shore of New York’s Upper Cassadaga Lake, sitting on a spiritualist’s front porch in the fading sunlight, hoping against hope that she’ll take pity on my sorry soul and give a reading. And that in the process, she’ll bring me good news from the other side. During the summer, tens of thousands flock to Lily Dale, established in 1879 as a gated spiritualist center and today the world’s largest community of mediums, with more than 35 certified mediums and spiritual healers registered with the assembly. Some read palms while others read Tarot cards or give aura chart readings; whatever their method of transporting messages from the Great Beyond, all must pass a test and be registered with a spiritualist church. I didn’t make it past the assembly’s picturesque brick gates until late on a Monday in mid-September, a few weeks after the town had buttoned up for the season. So rather than the hubbub captured in HBO’s recent documentary “No One Dies in Lily Dale,” which paints it as a pretty happening place, I was met with a spooky silence. At least I saved the daily $10 gate fee charged from June 24 to Sept. 4, right? Even one day after Labor Day, though, and you could wonder: That’s it? The one-room 1890 school house that contains the Lily Dale Museum is closed until mid-June. 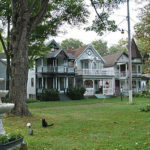 So is the Marion Skidmore Library, which houses the world’s largest collection of rare Spiritualist and metaphysical books, and the historic Maplewood Hotel, situated near the water and the center of activity since the 1880s, with the faithful gathering on its covered front porch on summer evenings to recount their day or quietly meditate. Arriving on a fall weekday, I also found the bookstore and souvenir shop and much-ballyhooed Crystal Cove gift store shuttered. (They’re only open weekends during October and November, depending on the weather.) No pun intended, but in fall, Lily Dale is, well, a ghost town. That said, there’s a certain charm to the village in the off season. The Ferris wheel and bowling alley on the beach that allowed men to “relax from their daily worries” are long gone, along with the childhood home of the Fox sisters, who helped create Spiritualism. The home was moved here from Hydesville, N.Y., in 1916, and destroyed by fire in 1955. 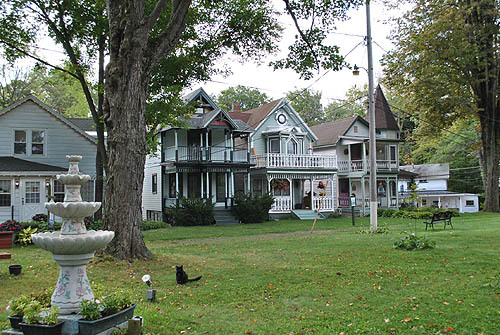 But I couldn’t help but be bewitched by the row of gingerbread Victorian houses lining Cottage Lane and after battling traffic for two hours, soothed by the town’s picturesque lakefront gazebo. I also got a kick out of seeing so many houses with “medium” shingles planted in the front yard, even if most of them weren’t officially open for business and many were in desperate need of serious renovation; I half expected Allison Dubois (the character played by Patricia Arquette on NBC’s “Medium,” not the American author who claims to be a psychic) to come walking down the street. Spiritual types know to make an appointment to assure a reading during the off season. (There’s a list, with the mediums’ websites, at www.lilydaleassembly.com). I, on the other hand, had decided to leave it to fate. Which is how I ended up practically begging the aforementioned medium to do a walk-in at 7:30 at night. I initially wasn’t impressed with the hokey way she lit incense and turned on New Age music before asking me to lay my hands on top of hers. And what was up with the fuzzy bedroom slippers? The messages from beyond also were so general — my in-laws wanted to say “thank you” for keeping my husband on track and a friend who died last year wanted me to know her funeral was “lovely” — that I had to wonder if she wasn’t simply reading my body language and facial expressions, and telling me what she thought I wanted to hear. Then again, she knew (guessed?) my mother-in-law had crippling arthritis and that my girlfriend suffered a heart attack. Spooky. Maybe it wasn’t a total waste of 30 minutes and $70. Also verging on creepy (at least to someone used to having lots of people around) was spending the night — alone — in a 100-year-old guesthouse with nary a soul to speak to, a view through the blackness of an empty lake and no TV. Call me a baby, but every scary movie I’ve ever seen played in my head as I tried, with jangled nerves, to get to sleep. Regrettably, a sweet-looking Cup-a-Joe’s Coffee Shop in the middle of town wasn’t open the next morning for business. So my stroll through Leolyn Woods to Inspiration Stump, where mediums hold outdoor services twice a day during summer, was bleary eyed. Whether the messages spirits send to audience members are the real deal or the result of practiced fishing is anyone’s guess. But standing in trees, with only the rustle of the flag that rises like a crucifix from the tree stump breaking the silence and sunlight dappling the leaves, was definitely a spiritual experience.